A settlement between the Center for Biological Diversity and the California Department of Fish and Wildlife will close California’s Dungeness crab fishery three months early in 2019 to reduce the chances that whales and other sea life will become entangled in fishing gear. The crabbing season in 2020 and 2021 will also be shuttered early in places where high concentrations of whales come to feed in the spring, such as Monterey Bay. Conservationists applauded the changes, saying that they will save animals’ lives. Whales and sea turtles off the coast of California will have less time to contend with possible entanglements in crab fishing gear in 2019, after a one-and-a-half-year lawsuit settlement shortened the Dungeness crab season by three months in late March. The Tucson, Arizona-based Center for Biological Diversity sued the California Department of Fish and Game in 2017. The center argued that the agency’s authorization of the commercial fishery for Dungeness crab wasn’t in line with the United States’ Endangered Species Act because the equipment used in the fishery had led to a rise in the “illegal take” of humpback whales (Megaptera novaeangliae), blue whales (Balaenoptera musculus) and leatherback sea turtles (Dermochelys coriacea). 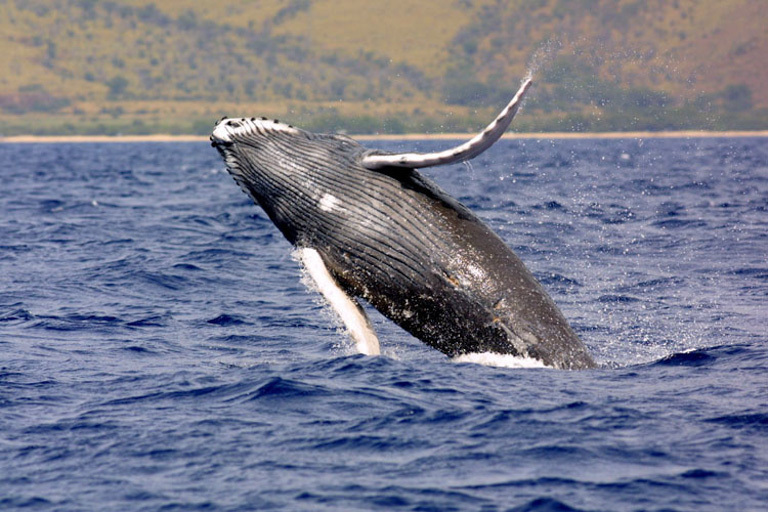 Humpbacks are considered endangered under the federal law in parts of their range; blue whales and leatherbacks are listed as endangered throughout their entire ranges. 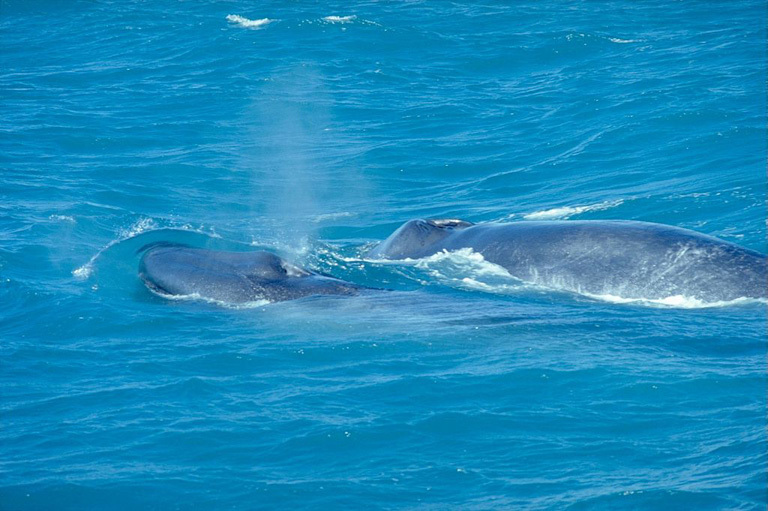 A blue whale mother and calf. Image by Andreas Tille via Wikimedia Commons (CC BY-SA 4.0). Twenty-two whales became entangled in crabbing gear in 2016 off the West Coast of the U.S., compared with 11 in 2015, according to the National Oceanic and Atmospheric Administration. 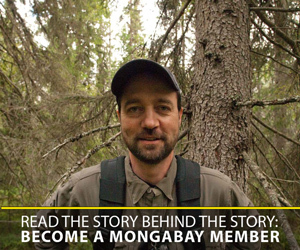 The Center for Biological Diversity negotiated the settlement with the state’s wildlife department, as well as the Pacific Coast Federation of Fishermen’s Associations, which intervened in the lawsuit. 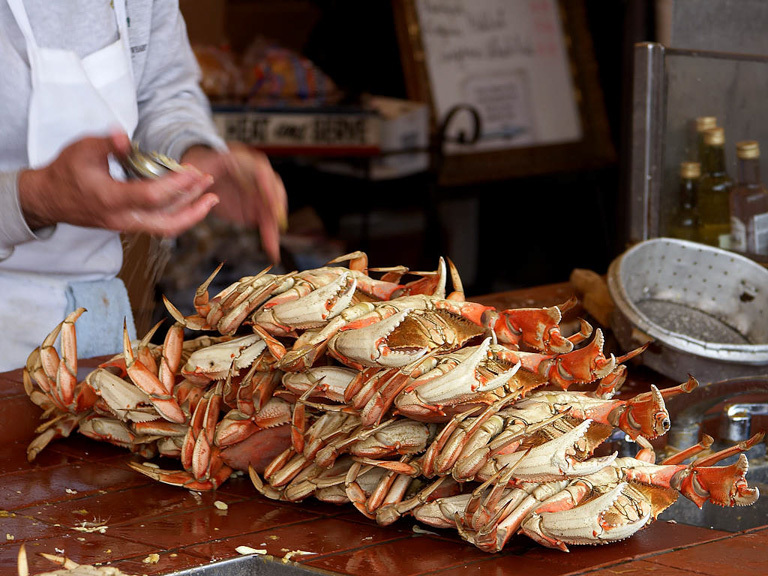 Dungeness crabs in San Francisco. Image by Jon Sullivan via Wikimedia Commons (Public domain). The lines that run between surface buoys and crab pots on the seafloor can ensnare whales and other sea life, causing infections, preventing them from feeding and, in the most serious cases, leading to drowning. In addition to the closure of the crab fishery on April 15, 2019, the 2020 and 2021 seasons will end on April 1 in each of those years in places where lots of whales feed in the spring, like Monterey Bay. If observers spot high concentrations of whales elsewhere, the agreement allows them to close the season earlier. Under the terms of the settlement — which still must be approved by the courts — the fish and wildlife department also must put regulations in place that require crab fishers to pull their lines and pots from the water instead of abandoning them to become floating hazards for marine life. A breaching humpback whale. Image courtesy of NOAA (Public domain). Oppenheim said the restrictions will make a difficult way of life even tougher. “This settlement represents the path back to normality for California’s crab fishery with built-in protections for whales and crab fishing operations under the Endangered Species Act,” Oppenheim added. Banner image of a humpback whale mother and calf courtesy of NOAA (Public domain).